I was looking around for a pink sundress. But then I saw this totally adorable white summer A-line, and my brain just went, Okay. Yes. This is a dress you add some shoes (high heel sandals maybe, or flipflops, or if you have to wear Real shoes, some pink Mary Janes). 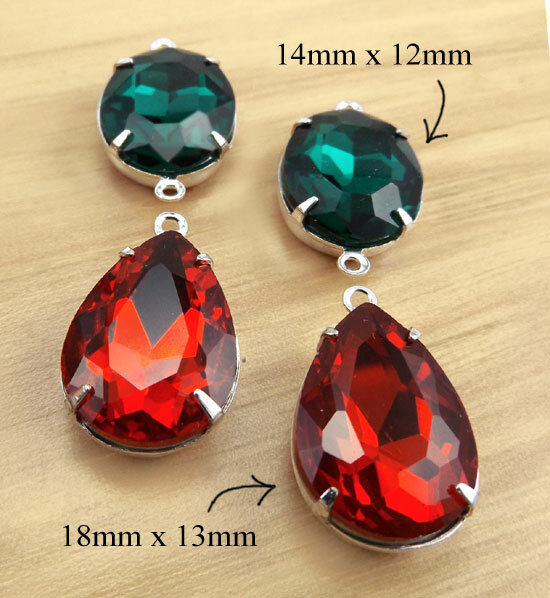 Earrings of course (I’m biased) – bright pink or green? A stack of bangles too, because I love them. And go. You’re dressed. You could wear this anywhere, work, play, church, shopping, meet the girls, meet the boys. And you’ll look fabulous. 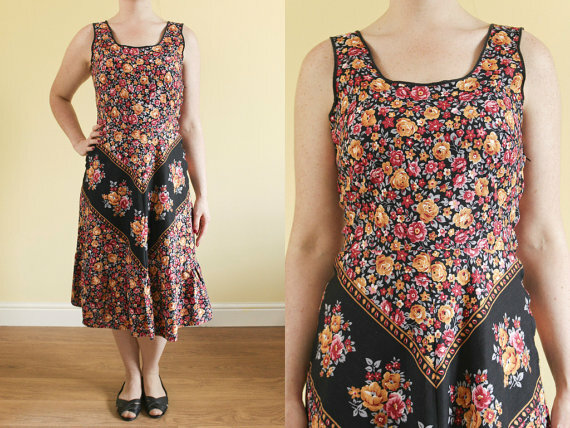 I found this sweet frock at Rogue Girl Vintage on Etsy. I have to tell you, they’ve got some serious chops. Great items, clear and helpful pics, and they give the relevant info that you absolutely need when you’re shopping online. I’ve been playing with color combos again – you know I like to do that. And these just struck me as really fun. Or a bright red and white tank top and a bright emerald green short skirt. 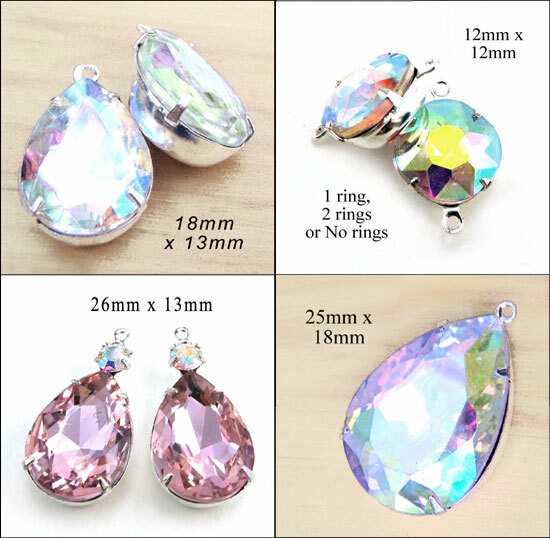 Flipflop sandals, a bangle bracelet, and these fun earrings. With a summer tan. You know I love vintage clothing – it’s ecologically smart, which is great – but honestly, it’s mostly that I’m selfish. I love finding things that are unique, usually well made, and just little bit more fun than the stuff you usually find in Macy’s or Kohl’s. You see what I mean? Look at the detailing at the neck and armhole. And that clever diagonal print! The dress looks cool and comfy (and cotton, which is great). It’s got its own style – you don’t have to DO a lot, if you know what I mean. You could dress it up – a fitted jacket, nipped in at the waist, or just a pretty cardigan). A great pair of heels. It could go to work, to your inlaws, or to dinner. But most of all? I’d love it casual. Toss this baby on, add a big pair of hoop earrings, maybe a stack of bangles, bare sandals, and go all day. And look good. I found this sweet dress at Venelle on Etsy. Sophie, the owner/curator, has some fab finds and a great eye. Even with international shipping (I’m in the U.S., Venelle’s in the UK) her items are really affordable. Go shopping, figure a couple or three weeks for shipping, and have fun! Did I mention how much I love vintage? Yes! Just a little comparison I did this morning. 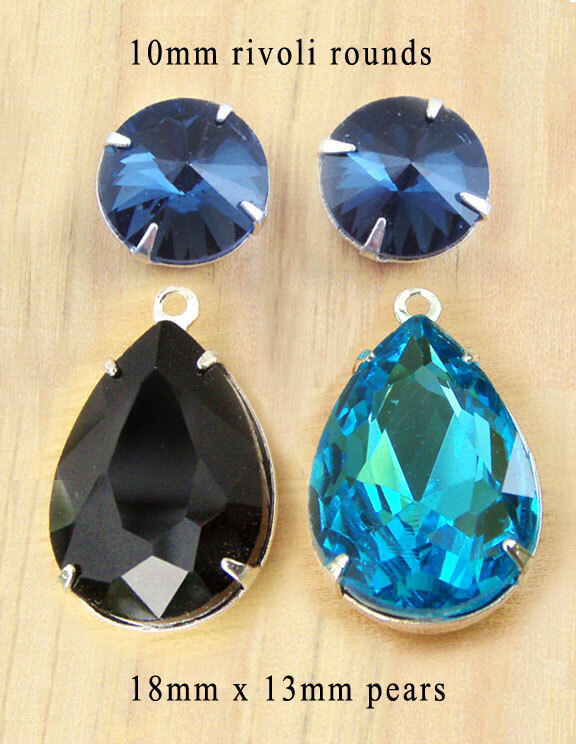 I placed montana sapphire (navy blue) round rivoli jewels near some teardrops, one of them opaque black, one vivid aqua blue. It’s just interesting how the eye perceives these. The combo on the left, with the opaque black teardrops, feels a little more Goth. The combo on the right, a little more fun and frivolous. That’s before we think about it. After we take time to reflect, we simply see the colors that match the definitions of “navy”, “black”, “aqua” (or turquoise). But at first? Goth. Somber. And frivolous. The brain is an interesting organ, yknow? 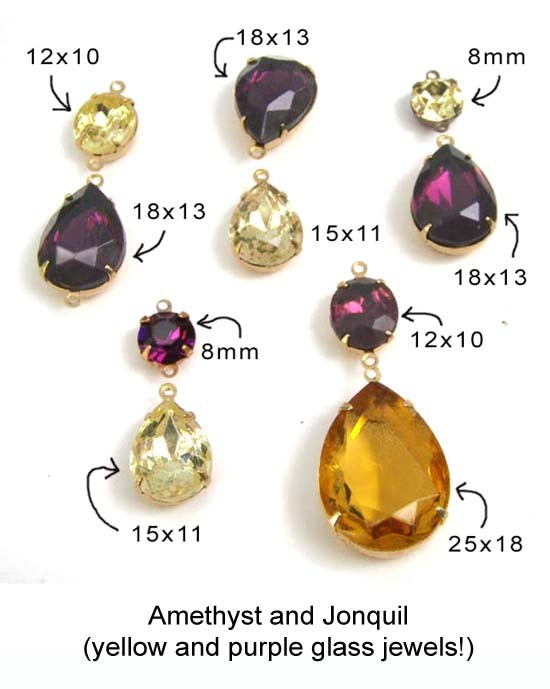 These were jewels that were on my worktable from a couple different projects – and you know how I do sometimes – I just fiddle with different combos. 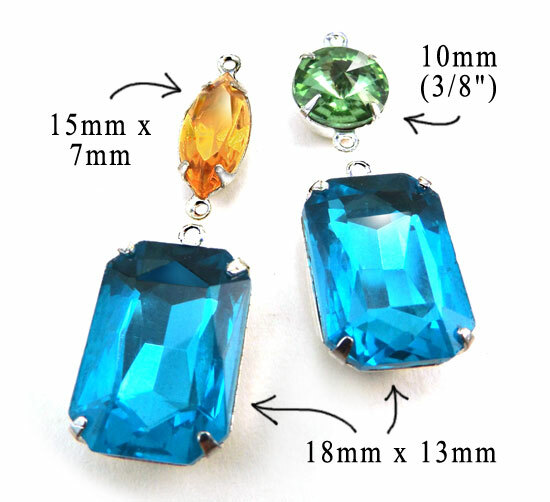 These are all strong colors – golden topaz navettes, peridot green round rivoli jewels, and deep aqua glass octagons. 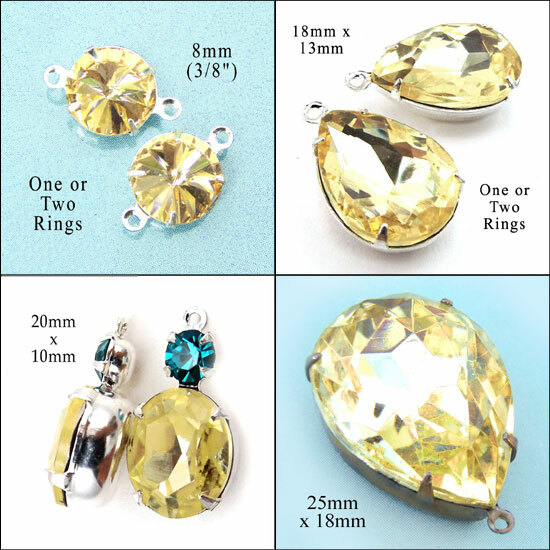 Any of them could be used alone, as is, for earrings or necklace jewels.